Welcome to the Avid Cruiser website! My goal is to help people like you make informed cruise vacation decisions by providing you with content that is personal, passionate, informed and inspired. On this site, you’ll find articles, videos and photos designed to help you make the best decision for your cruise vacation, your time on ship and your time in destinations. It’s important that you know about my relationships with the companies I report on and fees I receive for projects, referrals and leads. I can say what I like, of course, but in the end, you’re the best judge of what’s right for you. 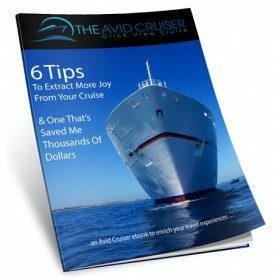 Cruise lines, destinations and travel agents do support Avid Cruiser. So here are some questions that you may have. Do cruise companies or destinations ever pay us to write specific articles? We wish! Cruise companies, however, do support the site with monthly sponsorship fees. Do they ever dictate to us what to write? Never. However, cruise companies may submit article ideas that we will publish should we deem them to be editorially worthwhile for our readers. Do they ever ask us to remove stories that they may not like from our web site? No. Do we filter negative comments from readers? No. We do moderate comments in that we have to approve them before they are posted. This is to keep out spammers. On the contrary, we encourage opposing views or any information that will help inform others. Also, we cruise for free. Does that bias us? Hard to say. What is certain is that we can only write authoritatively about ships that we’ve experienced. Moreover, almost all staff at all cruise web sites, including international publications, travel for free or at press rates that are a mere token. We’re also invited on press trips and inaugurals, all expenses paid. Otherwise, we couldn’t afford to cover the cruise industry adequately. Can you trust our reporting? That’s something only you can judge. Am I a travel agent? No. But I do make recommendations to those who ask for them, and I may receive commissions from travel agents or travel suppliers for referrals and leads. Thank you for dropping by. We hope to see you here more often. Description of Services. Avid Travel Media makes various services available on this Site including, but not limited to, informational content and certain other amenities (collectively, the “Services”). The content provided by Avid Travel Media is free. Fees for cruises with Avid Travel Media are set out elsewhere in this Site. Through your use of the Site, you may have the opportunities to engage in commercial transactions with third party travel agents and cruise lines. You acknowledge that all transactions relating to any merchandise or services offered by any party, including, but not limited to the purchase terms, payment terms, warranties, guarantees, maintenance and delivery terms relating to such transactions, are agreed to solely between the seller or purchaser of such merchandise and services and you. WE MAKE NO WARRANTY REGARDING ANY TRANSACTIONS EXECUTED THROUGH, OR IN CONNECTION WITH THIS SITE, AND YOU UNDERSTAND AND AGREE THAT SUCH TRANSACTIONS ARE CONDUCTED ENTIRELY AT YOUR OWN RISK. ANY WARRANTY THAT IS PROVIDED IN CONNECTION WITH ANY PRODUCTS, SERVICES, MATERIALS, OR INFORMATION AVAILABLE ON OR THROUGH THIS SITE FROM A THIRD PARTY IS PROVIDED SOLELY BY SUCH THIRD PARTY, AND NOT BY US OR ANY OTHER OF OUR AFFILIATES. To the extent that there are links to third party websites or comments from third parties on this Site, the third parties are not connected with Avid Travel Media. Avid Travel Media does not endorse, nor are we responsible for the accuracy or reliability of, any opinion, advice, or statement made by anyone other than an authorized spokesperson of Avid Travel Media speaking in his/her official capacity. Registration and Data Privacy. In order to access some of the Services on this Site, you will be required to register with Disqus or use a separate social media account. We do not receive the information that you provide to Disqus or to other social media platforms, but we do receive information that you provide to us to receive further information from us directly via electronic mail. By providing this information to us, you agree that all information is true and accurate and that you will maintain and update this information as required in order to keep it current, complete and accurate. We do not disclose information provided directly to us to third parties (except as needed to process payment or if you direct us to do so). Payment of Fees. If you subscribe to a service on this Site that requires payment of a fee, you agree to pay all fees associated with such service in advance of receiving such service. You agree to provide us with accurate and complete billing information, including credit card information, your name, address and phone number, and to provide us with any changes in such information within 30 days of the change. If, for any reason, your payment fails to process or is returned for lack of sufficient funds, we may, at our option, suspend or terminate the Services. You may not use the Site or the Services to: download any file(s) that you know, or reasonably should know, cannot be legally reproduced, displayed, performed, and/or distributed in such manner; violate any code of conduct of other guidelines which may be applicable for any particular Service; harvest or otherwise collect information about others, including email addresses, without the authorization or consent of the disclosing party; violate any applicable laws or regulations; or create a false identity for the purpose of misleading others. You may not use the Services in any manner that could damage, disable, overburden, or impair any server of Avid Travel Media, or the network(s) connected to any server of Avid Travel Media, or interfere with any other party’s use and enjoyment of any Services. In addition, you may not use your account to gain access to any Materials or information through any means not intentionally made available through the Services, breach security of another account, or attempt to gain unauthorized access to another network or server. Not all areas of the Site may be available to you or other authorized users of the Site. Users who violate systems or network security may incur criminal or civil liability. You acknowledge that we will cooperate fully with investigations of violations of systems or network security at other sites, including cooperating with law enforcement authorities in investigating suspected criminal violations. You agree to reasonably cooperate with Avid Travel Media and law enforcement authorities in investigating suspected violations. Copyright © 2017 Avid Travel Media Inc. All Rights Reserved. Use of Site and Storage of Material. You acknowledge that we may establish general practices and limits concerning use of the Services available on our site, including without limitation the maximum number of days that uploaded Content will be retained on the Site, the maximum disk space that will be allotted or our servers on your behalf, and the maximum number of times (and the maximum duration for which) you may access the Services in a given period of time. You agree that we have no responsibility or liability for the deletion or failure to store any Content maintained or transmitted on or through this Site. You further acknowledge that we reserve the right to change these general practices and limits at any time, in our sole discretion, with or without notice. You should not rely on the Site as your only storage facility. You should preserve backup copies of any digital data, information or other Materials that you have uploaded. You agree not to hold us for any damage to, any deletion of or any failure to store your files, data or Registration Data. Non-Disparagement. You shall, during and after the participation in and use of the Services, refrain from making any statements or comments of a defamatory or disparaging nature to any third party regarding Avid Travel Media, or any of Avid Travel Media’s officers, directors, employees, personnel, agents, policies, services or products, other than to comply with law. Governing Law. This Site (excluding any linked sites) is controlled by us from our offices within the State of North Carolina, United States of America. It can be accessed from all 50 states, as well as from other countries around the world. As each of these places has laws that may differ from those of North Carolina, by accessing this Site both of us agree that the statutes and laws of the State of North Carolina, without regard to the conflicts of laws principles thereof and the United Nations Convention on the International Sales of Goods, will apply to all matters relating to the use of this Site and the purchase of products and Services available through this Site. Each of us agrees and hereby submits to the exclusive personal jurisdiction and venue of the Superior Court of Buncombe County and the United States District Court for the Western District of North Carolina with respect to such matters. Notices. All notices to a party shall be in writing and shall be made either via e-mail or conventional mail. Notices to us must be sent to the attention of Ralph Grizzle at [ralph.grizzle@gmail.com], if by e-mail, or P.O. Box 2807, Asheville, NC 28802, if by conventional mail. Notices to you may be sent either to the e-mail address supplied by you to access certain Services. In addition, we may broadcast notices or messages through the Site to inform you of changes to the Site or other matters of importance, and such broadcasts shall constitute notice to you. You acknowledge and agree that during your participation in and use of the Services you may be exposed to Confidential Information. “Confidential Information” shall mean all information, in whole or in part, that is disclosed by Avid Travel Media or any participant or user of the Services or any employee, affiliate, or agent thereof that is nonpublic, confidential, or proprietary in nature. Confidential Information also includes, without limitation, information about business, sales, operations, knowhow, trade secrets, technology, products, employees, customers, marketing plans, financial information, services, business affairs, any knowledge gained through examination or observation of or access to the facilities, computer systems and/or books and records of Avid Travel Media, any analyses, compilations, studies or other documents prepared by Avid Travel Media or otherwise derived in any manner from the Confidential Information and any information that you are obligated to keep confidential or know or has reason to know should be treated as confidential. Confidential information does not include information already in the public domain, anything voluntarily disclosed by the disclosing party, anything independently developed by you or information disclosed in compliance with a lawfully issued process compelling disclosure. Your participation in and/or use of the Services obligates you to: (i) Maintain all Confidential Information in strict confidence; (ii) not to disclose Confidential Information to any third parties; (iii) not to use the Confidential Information in any way directly or indirectly detrimental to Avid Travel Media or any participant or user of the Services. Effective May 25, 2018 Updated for the General Data Protection Regulation(GDPR). Avid Cruiser is owned by Avid Travel Media Inc., incorporated in North Carolina, USA. We can be reached via this contact form on the Avid Cruiser website. Avid Cruiser’s website address is: https://www.avidcruiser.com. The information gathered during general browsing of our Site is used to analyze trends and usage of the Site and to improve the usefulness of the Site. It is not connected with any personal information. In general, you can browse Avid Travel Media Inc.’s (“Avid Travel Media,” “We,” or “Us”) website, Avid Cruiser [www.avidcruiser.com], website (the “Site”), without telling us who you are or revealing any personal information about yourself. The only information we gather during general browsing is via Google Analytics and would include information like your IP (Internet Protocol) address, domain name, browser type, operating system, and information such as the web site that referred you to us, the files you downloaded, the pages you visit, and the dates/times of those visits. Avid Travel Media may retain correspondence and the information contained therein (e.g. name, mailing address, phone number) and use such information to respond to your inquiry and/or provide you with our newsletter. Your name, e-mail address, and postal address information is never sold, given, or otherwise shared or disclosed to third parties unless you expressly authorize us to do so (e.g. if you requested a travel agent recommendation and expressly authorized us to pass your information onto the agent, we would send the information to the agent). If you do not wish to receive notifications or correspondence from Avid Travel Media, you may unsubscribe from our newsletter using information provided in the newsletter itself. If you directly correspond with Avid Travel Media but wish to terminate your communication with us, please advise Avid Travel Media of this fact in direct response to the e-mail correspondence. If you correspond with Avid Travel Media via e-mail, the postal service, or other form of communication, you may reveal personal information about yourself to Avid Travel Media (e.g. name, e-mail, and postal address information). If you correspond directly with Avid Travel Media to make a purchase, you will be asked to submit payment card information to a third-party payment processor, Quickbooks or Gumroad. We collect data from users that have subscribed to our newsletter, left comments or filled out forms. We ask for consent during the process with a checkbox. A link to this page is provided during the process. The legal basis for us to collect the data is to be able to provide you with a service. The comment section of the Site provides a forum for users to comment on content provided through the Site and to discuss what they are seeking or value in a cruise. To participate, you are asked to provide information through third party sites (e.g. Disqus, Facebook, Google Plus, or Instagram). The information that you share with these third-party sites is not shared with Avid Travel Media. However, information that you post on Avid Travel Media’s comments page will be available to Avid Travel Media and to other users. As such, you should take care in what you share in the comments section. You may delete comments posted on the Site or ask us to delete comments at any time pursuant to the terms of Disqus or another third-party social media platform. When visitors fill out forms on the site we collect the data shown in the form, and also the visitor’s IP address and browser user agent string to help spam detection. Providing personal information on the Site is optional. If you choose not to provide personal information, you can still browse and use Avid Travel Media’s Site, but you will not be able to correspond with Avid Travel Media or access other features of the Site that require personal information to be provided. Avid Travel Media Inc. relies on third party services to maintain its own services. Avid Travel Media Inc. never shares or resell any of its data. With the exception of user comments (which are controlled and posted by you), Avid Travel Media does not sell or share any personally identifiable information volunteered on the Site to any third party without prior consent. However, Avid Travel Media assumes no responsibility for the security of information. 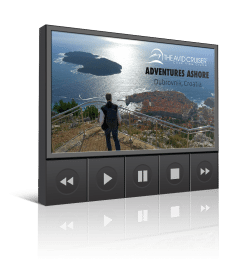 As set forth previously, Avid Travel Media’s Site contains link to sites external to the avidcruiser.com domain. Avid Travel Media is not responsible for the privacy practices or the content of such sites. The Site is not directed to children under 13 years of age, and we do not knowingly collect personal information from children under 13. If we become aware that a child under 13 has provided us with personal information, Avid Travel Media will delete such information from our files. Moreover, by using this site, you represent that you are at least 18 years of age, or that you are at least 18 years of age and have given us your consent to allow any of your minor dependents to use this Site. If you are under the age of 18, do not use this Site without parental consent. Avid Travel Media reserves the right to modify this Privacy Notice at any time, so please review it frequently. Changes and clarifications will take effect immediately upon their posting on this Site. If we make material changes to this Notice, we will notify you on this Site that it has been updated, so that you are aware of what information we collect, how we use it, and under what circumstances, if any, we use and/or disclose it. If Avid Travel Media is acquired or merged with another company, your information may be transferred to the new owners so that they may continue to sell products to you. The Site is administered by Avid Travel Media from its offices in North Carolina. These Terms will be governed by and construed in accordance with the laws of North Carolina, without giving effect to any principles of conflicts of laws. Any matter and/or dispute relating in any way to your visit to or interaction with the Site or with this Privacy Notice, including compliance with these Terms, shall be filed in the state courts of Buncombe County, North Carolina or in the Western District of North Carolina. You consent to exclusive personal jurisdiction and venue in such courts and waive any objection based on inconvenient forum. If you would like to access, correct, amend, or delete any personal information that we have about you; register a complaint; or simply want more information, please contact us at privacy@avidcruiser.com or by mail at P.O. Box 2807, Asheville, NC 28802. Lito our steward and his whole crew did an awesome job! They were always super friendly and always were working hard when we saw them. Thanks Lito and the crew on deck 7! !